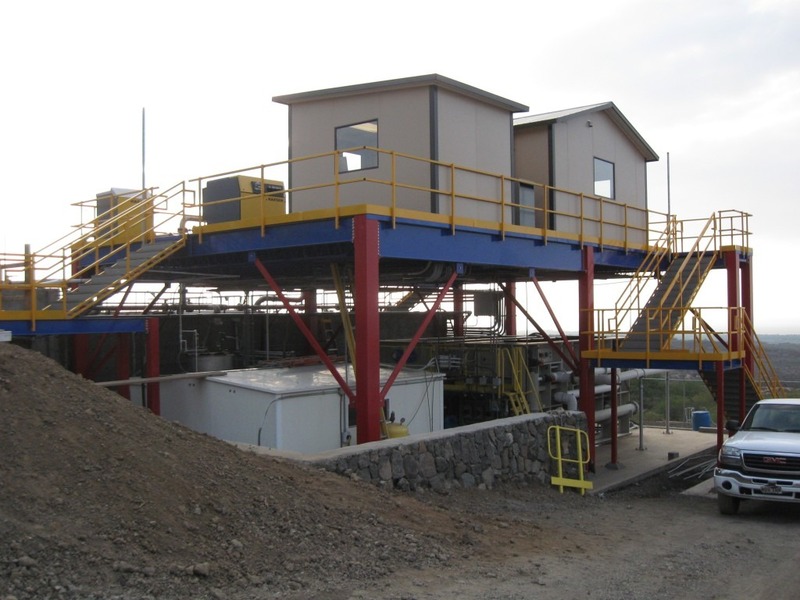 Prefabricated mezzanines are custom built to fit a specific area. These can be single or multiple levels and they are often installed within manufacturing plants, retail stores, office buildings, industrial plants, warehouses, distribution centers, institutions, recreation or government facilities etc. Structural mezzanines add a second or third level in a facility, therefore, adding space by two-folds to the existing area. Typically, modular mezzanines create new space within an office, add to the storage, production or assembly space, enlarge locker rooms, departments, cafeterias, and work platforms. Custom mezzanines can be built to fit around an existing area, equipment, building columns or other obstructions. They also incorporate additional column spacing, cantilevering or wide spans. These mezzanines often coalesced with conveyors, vertical lifts, racks, in-plant modular offices, shelving systems, and other material handling products that help maximize space and improve product flow. Space: Prefabricated mezzanines utilize your office space efficiently. Whether you want a large storage space or working space or simply a large display area in a retail store, these additional floors will work perfectly. The workspace is optimized for more efficient storage and use and these floors really add space. Add value to a property: Having structural mezzanines installed adds value to your property. If you’re leasing the workspace then your landlord would be really happy with additions to his property. Custom mezzanines work for all types of businesses. With additional floors, you are doubling or tripling the office space. You are building up rather than out. Facilitate a growing workforce: Prefabricated steel mezzanines aren’t just for warehouses or retail; they are flexible structures and can be used for increased office space by adding to the floors of the office, rather than cramming your entire workforce in one room. You can create multiple stories with mezzanines without having to pay the cost of leasing or buying a new structure. Cost efficient: Installing mezzanine offices is significantly cheaper than purchasing a new space or leasing a multi-story structure and it’s quicker plus easier to simply have actual floors installed to your existing space. With prefabricated mezzanines, your utility bills for heating or cooling will reduce substantially because they are often lowered and allow efficient circulation of air. In fact, the top floors can be used for office during summers and bottom floors can be used for storage – the vice versa during winters. Versatility and Durability: Modular mezzanines are versatile and durable while any type of business can use them. They add to the storage space so warehouses use structural mezzanines a lot to add floors within a facility. It is a cost efficient, quick and easy way to add storage space. Retail outlets use these to increase their display area without having to move to a new location. It adds to the office space and retailers can display their products all the way to the roof. Offices often use cubicles which are convenient and adding floors simply adds to the overall working space. This is ideal for growing businesses. There are a number of space layouts they can choose from or even have them customized. Custom mezzanines are durable plus they’re made out of steel which does not deteriorate like traditional office structures. Your modular mezzanines will keep their appearance for years to come. Conventional building structures are rigid and immovable with hard steel studs and drywall constructions, but these prefabricated steel mezzanines have movable walls, all designed in a controlled environment. These systems are easily installed over a span of few days compared to the traditional office structures. Panel Built a leading modular design solutions provider offers the best available prefabricated steel mezzanines. Some of the cheapest modular mezzanines available with ample customizations can be found at Panel Built. We offer the best modular mezzanines available online which are an added benefit since Panel Built allows you to order structural mezzanines online through the website. Panel Built modular offices and mezzanines are 100% relocatable and expandable. We offer many options to buy or lease, as well as assistance with financing. We ensure strength and durability, which is the “core” of our building quality. Our light-weight, highly mobile structural panels meet all military specifications and exceed most national building codes and OSHA requirements. Panel Built Inc. is a world class manufacturer of modular offices, prefabricated buildings, and steel mezzanines. We believe in total customer satisfaction. We pride ourselves on fully understanding and delivering our client’s space needs and providing creative solutions within their budgets. Our customers, dealers, and employee relationships are the foundation of our company. We strive to provide a safe, rewarding, and positive work environment to enrich the lives of our employees and their families. We offer custom modular offices, custom mezzanines, pre-assembled and exterior buildings. All our multiple product lines are produced on site, in two state-of-the-art manufacturing facilities. Our hardworking sales team provides individual attention to each client’s need by giving them confidential free quotes and CAD drawings to help get your project underway. Our team is available to speak to customers 24/7 about a quotation, a running order, freight options or project adjustments. We boast of unparalleled customer service and the team works in coordination with our shipping and installation departments to ensure an on-time delivery and installation, with the least amount of disruption to your business.